Conservatorium Maastricht, very international in its composition and mindset, is a close-knit community. We believe in collectivity, in the will to challenge each other and excel ourselves. To add value, in and with music. We enable and inspire students and lecturers to develop by learning, teaching, creating and performing. We prepare our students for a career in music beyond borders and believe in lifelong learning. 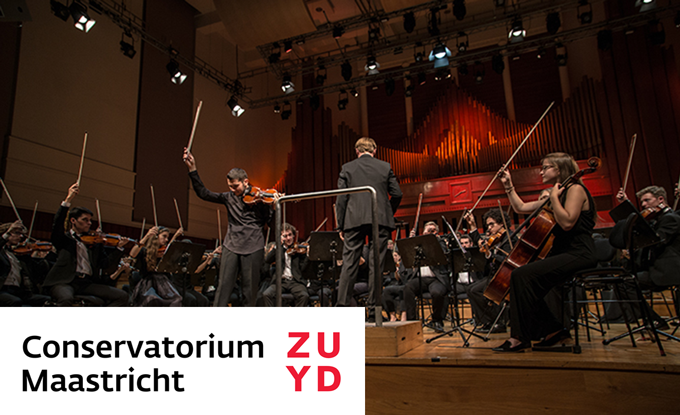 Conservatorium Maastricht is the most international conservatory in Europe, with a global mindset, connecting the local to the national and international. Students and lecturers of Conservatorium Maastricht are innovators and offer a valuable contribution to the international world of music and to society, either as performers/creators, teachers, researchers and/or entrepreneurs. Our educational program is based on links across disciplines as well as with the music industry, other art disciplines, educational and cultural organizations and businesses. Conservatorium Maastricht is part of the Faculty of Arts Maastricht of Zuyd University of Applied Sciences, which comprises the Academy of Performing Arts, i-Arts, Communication & Multimedia Design, Maastricht Fine Arts & Design and Architecture. With around forty Bachelor's and thirteen Master's programs, 15,000 students and 1,700 staff, Zuyd University of Applied Sciences, is one of the biggest universities of applied sciences in the Netherlands. Its wide range of programs offers countless opportunities for multidisciplinary collaboration. The Music Theory department of the Conservatorium Maastricht is looking to appoint inspiring and (historically) informed lecturers, who have an international education and are aware of the most recent developments in teaching music theory to young musicians of tomorrow. We are seeking to appoint a professional music theorist with practical skills, including improvisation, who can work across disciplines and relate to music practice. Essential is the ability to work didactically and with an open mind to the further development of the curriculum. The ideal candidate will possess teaching experience in higher music education, is knowledgeable in the field of 20th and 21st century music and has excellent English language skills. An appointment of 0,6 fte for a duration of 1 year with the Stichting Zuyd Hogeschool, with the prospect of a permanent appointment. Depending on former education and experience, classification takes place in accordance with the CAO HBO within the career perspective of scale 11 (maximum € 4.777,65 gross per month for a full time appointment). For further detailed information, please contact Pieter Jansen, Head of the Classical department, telephone number + 31 43 346 6341 or by email pieter.jansen@zuyd.nl. You can apply before the 12th of April 2019 by uploading your personal details (including a motivational letter, CV and three references) on the website www.werkenbijzuyd.nl. The interviews are scheduled for Week 19. Interviews will consist of a trial lesson and an interview.